Here's a fun item for ACTION FORCE/ G.I. 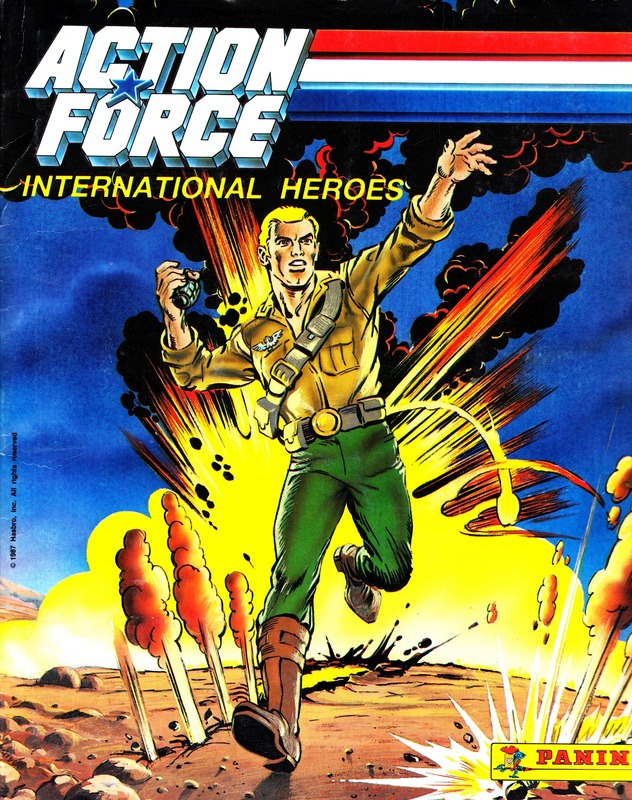 JOE collectors and fans of the Marvel/ Sunbow JOE TV show: the UK's ACTION FORCE STICKER ALBUM. Collecting sticker albums (and the inevitable trading of swaps in the playground in a, usually fruitless, attempt to offload the ever-growing pile of duplicates in exchange for the final few illusive stickers) was a rite-of-passage for pretty much all UK-based geeks (unless they had cash-conscience parents who quickly twigged the futility of any such collecting project and put the kibosh on the whole thing). The uncool kids collected albums based on movies, TV shows and licensed characters, leaving their more sporty opposite numbers to concentrate on similar football sticker collections. The retail model was always the same: the album itself was a (usually) cheaply-produced book with hundreds of empty spaces for the stickers. 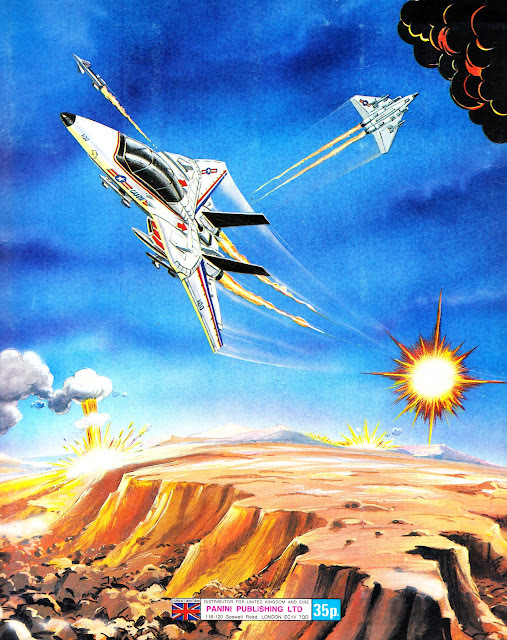 The album included additional text related to the (absent) image, usually (as in this case) telling a story. To complete the album, collectors had to buy numerous (hundreds!) of extra packets of stickers, containing a random assortment (the unsporting idea of limited edition "chase" cards hadn't infected the industry at this point although some stickers, especially shiny ones, certainly seemed more elusive than others) of stickers. These were sold behind-the-counter in local newsagents. The lifetime of any collection was fairly limited which, almost inevitably, meant it was impossible to complete the album before the stickers vanished (but not before you'd spent a fortune trying) from sale. The back of the album did offer limited salvation: the opportunity to buy those elusive last few cards direct from the publisher. For a price. The sticker publishers (of which Panini* was the most prevalent although Merlin and others also made valiant efforts to muscle-in) realised that kids were unlikely to stumble across the albums and spontaneously start collecting and formed a faustian pact with Britain's purveyors of comics. The deal was always the same: in the first week of the promotion, the album and a starter pack of stickers were polybagged free with the comic. In week two, the comic would include more stickers, sometimes printed on a single sheet (presumably to prevent unscrupulous newsagents from flogging the packs) but sometimes just a standard sticker pack. Readers were, of course, encouraged to keep collecting in breathless editorials. The sticker lords loved it: it was the equivalent of giving would-be smack addicts their first hit for free. The comics guys, in exchange, got two weeks of sales boosting free gifts without the effort of actually having to do anything themselves. The only people that actually paid for the albums were non-comic readers or slow-starters who started collecting later than anyone else. However, salvation was sometimes at hand: the same album would often be given away (in the same week) with multiple comics from the same publisher ensuring brand-loyal geeks had duplicate albums (we kept the stickers... of course!). For the album publishers, selecting the right property always had a wheel of fortune element: how to predict which media property would be the next big thing... and dodge the stinkers. It's unlikely many kids felt compelled to complete the DUNE album, despite a Tharg-endorsed 2000AD giveaway. 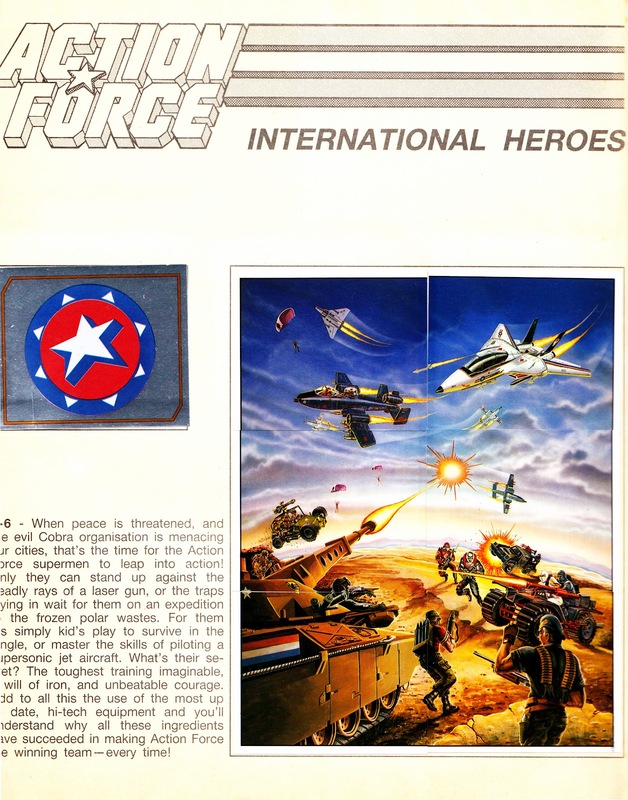 This particular collection appeared after Hasbro took over the ACTION FORCE range from Palitoy and buffed-up their marketing efforts. The toys (already G.I. JOE in all but name) were reissued in smart new (and much more exciting) packaging based on the US line. The TV commercials suddenly became much more polished and featured animation (lifted from the original US spots and the TV show) for the first time. Inevitably, the comics license shifted from IPC's BATTLE ACTION FORCE to Marvel UK, who launched a glossy new weekly which looked far classier than its black-and-white newsprint predecessor. The album (which is slightly wider than my A4 scanner, hence the slight loss of image at the edges) and stickers were based on the G.I. JOE animated TV show. The stickers featured stills from a number of episodes, the album explained the story. 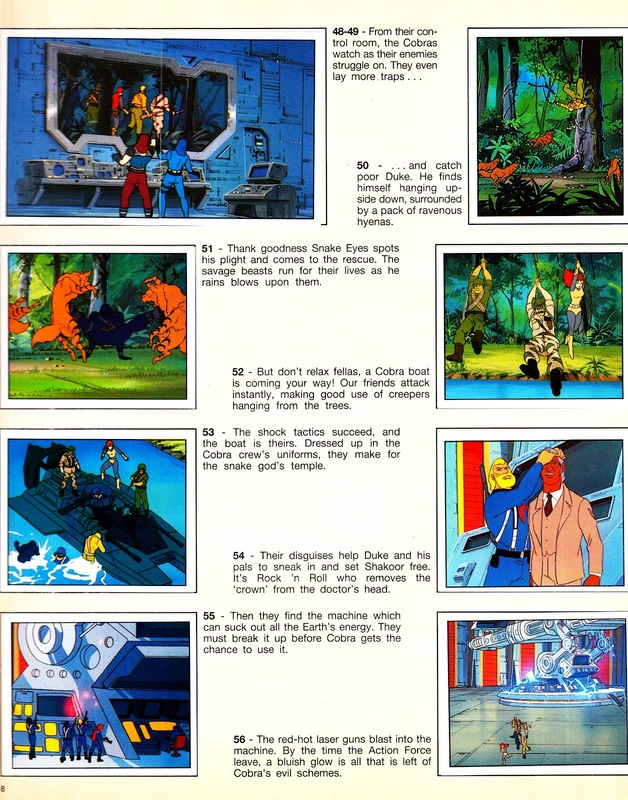 The JOE show never sold to a UK broadcaster (presumably they were already saturated with toy shows or the overtly militaristic tone made them skittish), forcing fans to track down the limited number of episodes released on VHS. * Better known these days for reprinting Marvel comics throughout Europe. Marvel acquired the Italian sticker seller during the expansionist early 1990s and folded Marvel UK into its new European operation. When the cash ran out, Marvel was forced to sell Panini but included the reprint deal as a sweetener.